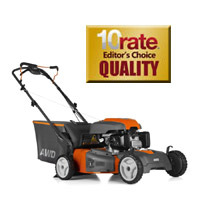 This self propelled push mower is one of the stronger ones available. Husqvarna made a very reliable machine with this one. Its a breeze to push the HU800 around the lawn thanks to the all-wheel drive power with a max forward speed of 3mph. The bag capacity is generous at 2.4 cubic feet as well. The 4-cycle engine starts with a single pull of the cord, and its 3-in-1 cutting system bags, mulches, and side discharges all together. We were impressed with the solid construction of the heavy steel deck, which has side bumpers that rake the grass in for a smooth trim. The cutting deck and be adjusted to nine different levels between 1 and 4.25 inches. The front and back wheels are both 8 inches which makes the handling and maneuverability excellent. There was never a problem with gaining traction on different terrains. All of these features drive the price up a bit and it can be considered a bit expensive compared to other push mowers at around $500.00.